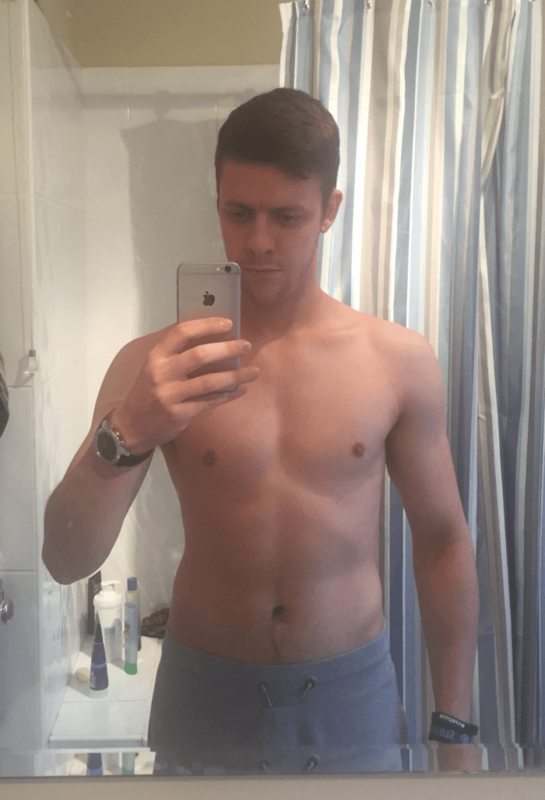 Muscle for Life Success: Sam B. "I definitely feel more energetic and have a newfound sense of confidence!" There is 1 year between my before and after pictures. In my before picture, I’m at around 145 pounds and maybe 12% body fat. My after pictures show me at 160 pounds and around 9-10% body fat. I bulked for 9 and a half months and got up to 170 pounds and then cut for 7 weeks to get down to 160 pounds. So overall, the pictures represent 15 pounds gained with a little drop in body fat percentage. My 9 and a half month bulk increased my strength exponentially. I didn’t put enough emphasis on the big compound lifts before I discovered Bigger Leaner Stronger. However, once I started to, my deadlift went from around 60kg to 145kg (132 pounds to 319 pounds), and my squat from around 50kg to 115kg (110 pounds to 253 pounds). I did, however, bench press a bit before Bigger Leaner Stronger, so the increase isn’t as drastic. I increased it from around 50kg to 80kg (110 pounds to 176 pounds), plus it’s my worst lift! During my cut, I barely saw any drop in weight on my big lifts, which pleasantly surprised me! I used the 5-day split–back, chest, shoulders, legs, arms and then 2 days of complete rest on weekends (during my cut I did add cardio in on one weekend day). After all the bro-science you pick up when you first start lifting, I assumed that the rep ranges talked about in Bigger Leaner Stronger would have little effect on gaining muscle mass. The results have been pretty instantaneous and, in my opinion, fairly easy to achieve. On the training side, I prefer being able to lift big and get out of the gym in 45-50 minutes rather than slogging it out in the gym for over an hour like everybody else seems to do. On the diet side, once you discover that eating the same foods every day really isn’t that hard, it becomes incredibly easy to stick to your diet and not have to count macros all the time. Lastly, doing no direct cardio during my bulk (besides playing sports and general life activities) and only needing to do 2-3 hours a week during my cut was a bonus! 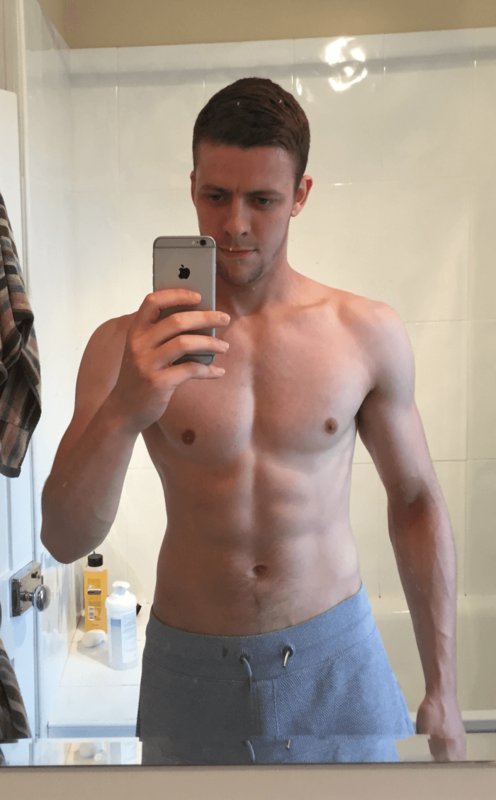 I had only been training properly about 6 months prior to starting Bigger Leaner Stronger, and just did the usual–mainly high rep chest and arms with no real idea as to what I supposed to do. I definitely feel more energetic in day to day life. Bigger Leaner Stronger has also given me a newfound sense of confidence. I have proved to myself that even I could gain significant amounts of muscle and strength when others didn’t think I could. With a little perseverance, I believe anything is achievable now if I put my mind to it! Most transformations you see on the internet are people who start with too much body fat and they undergo significant body re-compositions. For the most part, you can tell that they clearly had muscle mass before and it was just a case of shedding off the fat with a well constructed diet. However, I would recommend Bigger Leaner Stronger to the people who are starting at the other end of the scale–those who think genetics have banished them to a world of being under-weight and muscle-free. I think I’ve covered everything, however, I will just reiterate that this is a long process. Don’t think you have to shake things up just because your arms haven’t grown since a week ago. I encourage everyone to take pictures before they start (unflattering angles that show the reality of your physique even if you don’t want to see it). Then give it a few months. Once the results come in, keep hammering away toward a goal (mine was a holiday in a years time). Take the same pictures and you’ll be shocked at how far you’ve come. Also remember that the scale (and even to some extent the numbers on your lifts) isn’t everything. It’s about the overall picture. My journey probably differs from most others because I haven’t used any supplements along the way. Being someone that was too thin in the first place, once I really got into my bulk I knew I was getting more than enough nutrition from real food. As for other supplements like pre-workout, my energy levels have been so good (even during my cut due to the higher carb nature of Bigger Leaner Stronger) that I saw little point in spending the money.